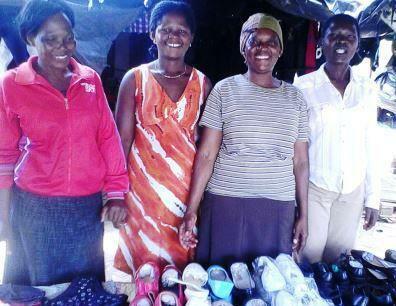 A loan of $1,600 helped a member she is planning to add more variety of clothing and shoes to her business and grow it further. Margaret is an innovative and hardworking member of the Vine Royal group from Highfields high density suburb in Harare. She is a cross border trader, selling clothes, footwear and blankets. She started her cross border business because of her need to generate income to support her herself and her children. Her children are now grown up and she lives with one grandchild who she sends to school. Despite adversity, her willpower and determination have allowed her to move forward and it is because of this that she has been involved in this sector for 10 years. She started her business walking around selling, and has business has grown into a flea market stall with better sales. She operates from Machipisa flea market, a popular shopping centre in Harare. She is aged 53 years and still active in business like her other group members who are middle aged women. Vine Royal group has three other members namely Needmore, Sabina and Shupikai who are all into the hardware business. The group has applied for its second loan with Thrive Microfinance. Their previous loans enabled them to manage to purchase bigger items for resale in their trades. Margaret and her group appreciate the entrepreneurial training they received from Thrive Microfinance which has helped them gain knowledge and skills in business management. With the Kiva loan she got, she is planning to add more variety of clothing to her business and grow it further. Her biggest desire is for her business to thrive thereby increasing her income levels and enabling her to offer her family a better quality of life. In the future she wishes to have more tables at the flea market. It helps women access affordable funding with targeted business training. Kiva shares THRIVE’s commitment to providing women with the opportunity to improve their own businesses. THRIVE is overcoming the financial obstacles of lending in Zimbabwe, and providing capital and finance training to the vulnerable women of of the country. In addition to loans, the organization conducts trainings that cover the strengths and weaknesses of their current business, opportunities for growth and the cost of borrowing. Additionally, each group’s management team attends a leadership-training course that covers group record keeping and cohesion. THRIVE Microfinance enables women in Zimbabwe to improve their businesses and lives.